A fall tradition gets underway across Wisconsin today, as the nine day gun deer hunt begins. Although license sales were a bit down earlier this month, officials with the Department of Natural Resources are still hoping for a strong turnout. For those heading out, Greg Matthews with the DNR says safety is one of their top messages this year. There were nine accidents during the 2008 season, with one fatality. Despite that, Matthews says it remains one of the safest sports in the state because of the safety classes most hunters have to take. This year marks the first time hunters can serve as a mentor, which allows them to bring a person who is at least 11-years-old with them. There can only be one firearm between both individuals and they must be within arms reach at all times. A special hunting license is required for those wishing to serve as a mentor. Hunters are also being asked to help the DNR identify some pests. Any hunter who spots a feral pig is being urged to shoot the animal. The pigs have become a threat to farmers in parts of the state because they destroy crops and potentially spread diseases. The DNR is also asking hunters to watch for illegal marijuana growing operations. That plea comes after officials have found large crops on public lands. Anyone who finds a marijuana plot is being urged to note the location and then contact the authorities. 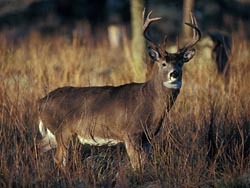 This is the first year in quite some time the DNR is not providing an estimate of the size of the deer herd. Officials decided to discontinue the practice after they were criticized last year for over estimating the size of the herd.